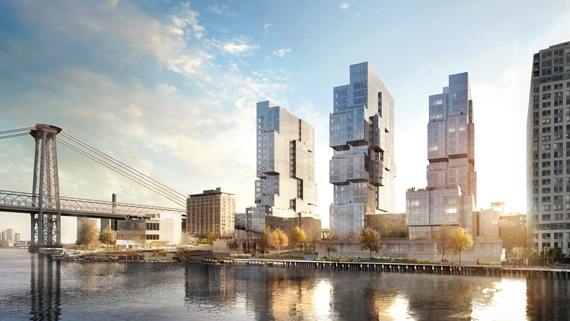 When Eliot Spitzer presented his Williamsburg waterfront project to fast-rising architect Eran Chen in September 2014, the timeline and budget allowed for little more than two boxy rental towers. Spitzer wanted to meet the deadline to qualify for 421a — the now-expired tax abatement program for new apartment building construction. That deadline, at the time, was June 12, 2015, and the former governor’s development company Spitzer Enterprises filed plans for the 470-unit rental project on Kent Avenue in December 2014. The city’s Department of Buildings approved the plans five months later. Christian Bailey, a founding principal of Chen’s Office of Design and Architecture (ODA), said the firm’s leader cut a deal with its client: If they kept to his tight schedule, Spitzer would need to add more money to the budget. And doing so allowed for the more “sculpted, melted iceberg” design that Spitzer ultimately adopted for the building. The development project, which is scheduled to be completed in 2018, marks Spitzer’s first foray into real estate construction after resigning from office in March 2008 in the face of a prostitution scandal. The former governor told The Real Deal that he was drawn to Chen’s ability to complete projects with “speed and efficacy” and said he wasn’t deterred by working with a young firm. “I’d rather have youthful creativity than older and stodgy” architectural plans, he said. 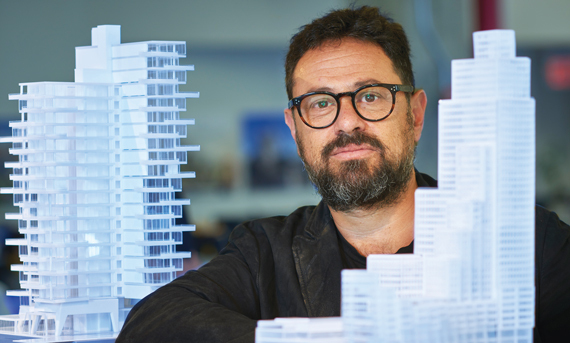 “Eran not only designs exquisite buildings from the exterior, but he understands that you need to build a building from the inside out,” Spitzer said. Chen, 45, founded ODA with Bailey in 2007. The two had met in 2004 while working together at the international architecture firm Perkins Eastman. They also brought in another Perkins alum, Ryoko Okada, as their principal and director of interior architecture. And in less than 10 years as a business, ODA has become one of the most active architecture firms in Manhattan and Brooklyn, according to a recent TRD analysis, establishing itself as a sought-after shop for its unique designs. The firm now has 80 employees and has completed 11 projects in New York City. It has another 12 under construction and 11 that Chen and his colleagues are drafting plans for. The gregarious architect called his office his home, second only to the one he shares on the Upper West Side with his wife, three children and their black Labrador retriever, Boo. He said ODA’s growth has occurred organically and that the firm now fills a void between the service-oriented architecture firms and the shops that produce more extravagant, high-concept designs. “We kind of capture the middle ground,” Chen said during an interview in his Union Square office in July. “And we bring fresh ideas that really adhere to the way that people want to live,” he added, carefully choosing his words as he spoke about his projects in his Israeli accent. One project that recently grabbed headlines is Triangle Assets’ planned Midtown East skyscraper near the United Nations headquarters. Chen’s plans for the slender residential tower at 303 East 44th Street appear as if the building is being slowly pulled apart, a design that the architect once likened to chewing gum suspended between the sidewalk and a shoe. 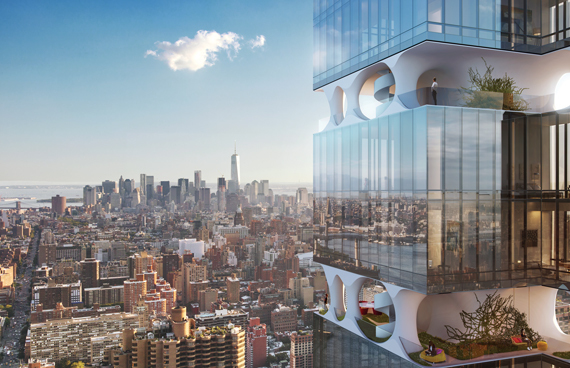 The glassy tower is segmented in a way that creates rooftop gardens between the floors, held up by sculpted, white columns. The outcome of thinking of buildings in this way, he explained, is a “pixelated or cubist” form. Many of Chen’s building’s share this look — one that is reminiscent of the Tetris-like housing complex Habitat 67 in Montreal. The prefabricated apartment building was designed by Israeli-Canadian Moshe Safdie for the World Exposition of 1967 to show a new way architecture could address crowded urban living. 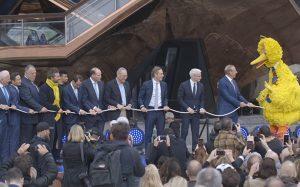 Chen said that building was ahead of its time and has been an inspiration to him. He added, however, that unlike his projects, the building sits in isolation on Montreal’s port. Now — on the heels of several assignments and completed projects in Manhattan and other cities — ODA has steadily extended its reach in Brooklyn. Chen and his colleagues are working with several big developers in the borough, including the Rabsky Group, Slate Property Group, Triangle Assets and Yoel Goldman’s All Year Management. In June, All Year Management announced that ODA would design its nearly 1 million-square-foot rental project at the former Rheingold Brewery complex in Bushwick. Goldman has enlisted ODA for a number of his other projects, including hotels in Crown Heights and Bushwick. Meanwhile, ODA is designing Slate’s 51 Jay Street — a warehouse that is currently being converted into condos in Dumbo — as well as its ground-up condo development, at 251 First Street in Park Slope. While Chen has received recognition for his work, he has yet to become a household name or capture the attention of critics in the same way that starchitects Bjarke Ingels, Robert A.M. Stern and the late Zaha Hadid have. Some argue that Chen’s ideas aren’t wholly original and that ODA’s designs follow a trend in which other firms — including Bjarke Ingels Group and Robert A.M. Stern Architects — are also engaged. John Patrick, founder of the architect talent agency Above the Fold, told TRD he believes Chen does good work, but feels he is hired for projects too often. He said that Chen doesn’t seem to take a definitive stand when it comes to the divide on social housing and luxury towers in New York, being a designer of both. “At the end of the day, when someone’s getting so much work, and you don’t understand what their philosophy is, that’s kind of alarming,” Patrick said. Chen showed interest in design at a young age, but said he realized he wanted to become an architect after serving in the Israeli Army for four years and traveling throughout South America and South Asia for a year after. Upon visiting India, he said, he fell in love with the way the villages were designed to promote a sense of community and connection with the outdoors. “When we say we’d like to improve people’s lives, we’re really attending to the psychological aspect of living in big cities,” he said. While Chen’s avant-garde designs are rooted in his belief in linking cramped urban dwellings to the outdoors, they can also be traced back to the first McDonald’s in Israel. That was his first major gig, in the early 1990s. The opportunity came about in a grocery store in Jerusalem, where the architect — then a second-year student — met one of the partners starting a franchise in Tel Aviv, and the discussion turned to Chen’s studies. “Out of the blue, he asks me if I want to design a McDonald’s for them, and I was like, ‘Are you sure about this?”’ Chen recalled. Chen went on to design 35 McDonald’s locations in Israel, he said, riding his motorcycle from his studio apartment in Jerusalem to the restaurant chain’s offices in Tel Aviv. By the time he graduated from the Bezalel Academy of Arts and Design in Jerusalem in 2008, he had a small practice of three people and a substantial portfolio, mostly consisting of McDonald’s restaurants and a few private homes. The architect still keeps a folder with pictures of the fast food locations, which were all designed differently — a major departure from the often identical McDonald’s restaurants seen in the U.S. Earlier this year, though, Chen had a humbling experience. His firm lost out on designing a residential project along Toronto’s waterfront. The developers, Tridel and Hines, had solicited ODA in November 2015 to bid on the condo tower, which is part of a $1.1 billion, mixed-use development spread across 13 acres. But in March, the developers announced that they had selected the Copenhagen-based architecture firm 3XN to design the condominium project. The competing firm, as it turned out, had presented a rendering that resembles ODA’s proposal, though shorter: A series of condos stacked in a stair-like fashion, creating space for garden terraces. “We have the utmost respect for their work,” Hines spokesman Mark Klegg told TRD. “There were three participants, and unfortunately there can only be one winner.” Klegg declined to say whether or not the similarities between ODA and 3XN’s designs were a product of the developer’s instructions to the architecture teams bidding for the project. He added that Hines would like to work with ODA in the future. Chen said he found it “disturbing” that the designs were so alike but that the developers feared that ODA’s plans would not fit within the zoning restrictions and might take longer to secure approval. The firm has also had to back out of projects on rare occasions. Chen said he recently had to stop working with a client on a project outside New York but wouldn’t elaborate further. Chen said he believes that developers will gradually become less obsessed with the views that their buildings offer — a quality that drives skyscrapers ever taller — and instead turn to creating buildings that have garden terraces or easy access to a park. ODA is in the process of conducting an internal feasibility study to see if private courtyards can be opened to the public. The firm is also looking into the even more ambitious idea of creating contiguous city blocks on buildings’ roofs. The roofs would serve as community gardens and even feature bike and running lanes, as Chen described it. Of course, such a plan would require cooperation from the city and the support of real estate owners. As tenants in the city increasingly seek residences with outdoor components, developers will move away from “glass box apartments at the end of a dead-end tower,” Chen said. Sitting in his office, Chen acknowledged that he is someone who expresses himself best with a pen in hand. Whenever he can sketch out his ideas, he explained, he has a better chance of helping his clients understand what he has in mind for a project. And when he gets an assignment, he usually thinks it over for a few nights before the project turns into “a little bit of an obsession,” he said. This obsession follows him around as he talks to his family at dinnertime and later walks his dog at night. Then the idea becomes an “informal feeling” about the project that begins to take shape as he meets with clients and studies the project site, he said. It’s a process that Chen refers to as “turning reality into art,” albeit one that doesn’t overly romanticize architecture as a profession. And in doing so, he is able to find beauty in the more grueling aspects of the job, he added. Correction: An earlier version of this story incorrectly stated the number of ODA’s employees. It’s 80.